This man is not the suspected Virginia gunman. After the shooting, a widely shared photo said he was. 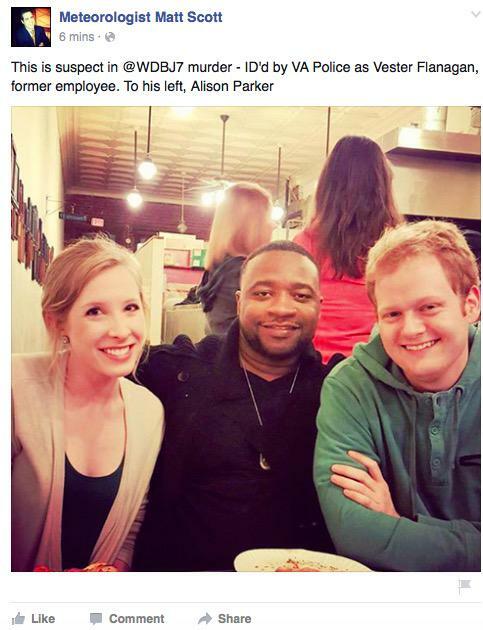 On April 26, Sherman Lea Jr., the executive director of New Hope Support Services and a board member of the Roanoke City Public Schools Foundation, posted a photo of himself at a local restaurant with WDBJ anchor Chris Hurst and reporter Alison Parker. Parker was killed Wednesday morning, along with cameraman Adam Ward, during a live television broadcast. Wednesday morning, Lea’s photo was widely shared by social media users and news outlets identifying him as suspected killer Vester Lee Flanagan II. 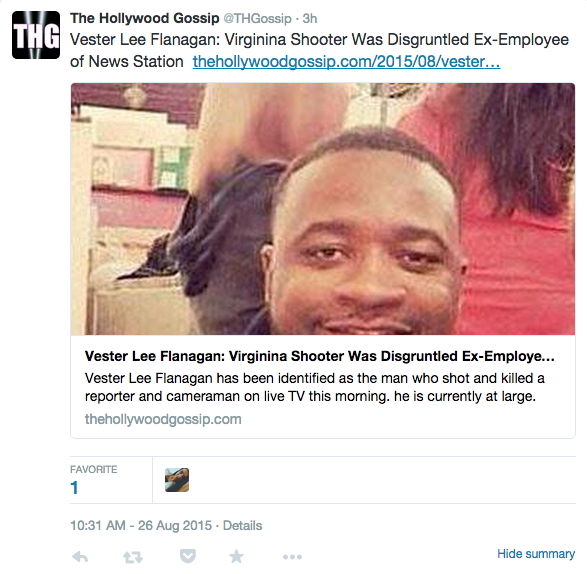 Flanagan posted now-deleted videos on Twitter and Facebook of the WDBJ shooting before killing himself. Lea quickly set the record straight on Twitter before tweeting a screenshot of a Facebook post that misidentified him. Lea could not be reached for comment. Though many of the original social media posts identifying the photo of Lea as Flanagan have been deleted, some international media outlets still feature the photo, and screenshots of the erroneous posts are circulating. As the New Republic notes, PhillyVoice has added a correction to their story, and authors from Hollywood Gossip and The Wrap acknowledged the error on Twitter. The Twitter account for political blog Politiwhat initially reacted skeptically to people questioning their posting of the photo but apologized when the error became clear. 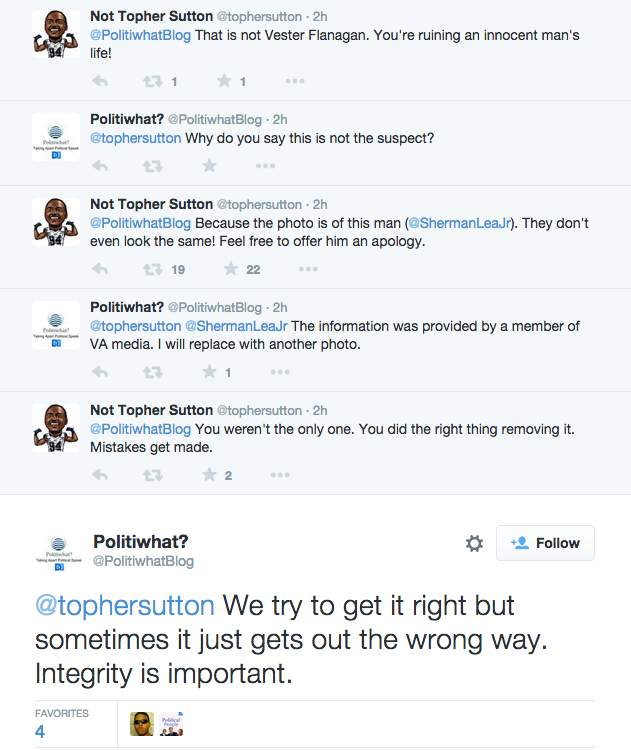 When reached for comment, Politiwhat’s owner said he originally saw the post from Connecticut meteorologist Matt Scott, who posted the photo of Lea with the caption “This is suspect in WDBJ7 murder — ID’d by VA Police as Vester Flanagan, former employee. To his left, Alison Parker.” Politiwhat provided a screenshot of the post. Corinne Geller, public relations director for the Virginia State Police, said in an email that the claim that the photo was released by police was false. “No law enforcement agency involved in this ongoing investigation released that photograph,” Geller said. Lea’s situation is familiar to those who remember Sunil Tripathi, the former Brown University student misidentified as a suspect in the Boston Marathon bombing before being found dead in Providence, Rhode Island eight days after the attack. And just over a week ago, Australian Sunny Burns was misidentified by Internet sleuths as the man behind a bombing in Bangkok, Thailand that killed 20 and injured 125. Alexis Madrigal, the editor-in-chief of Fusion, a multi-platform media company and cable network, excoriated the online speculation and misinformation machine in a 2013 Atlantic article about the Marathon bombings. A link to The New Republic has been added to this post.